This card's design is inspired by of the Gamera franchise. The tower from the artwork of Kyoutou Waterfront also appears in this card's artwork (in the upper-left corner). This card is the only Level 10 Kaiju monster. The effect "negate that effect, and if you do, you can destroy 1 card on the field." does not target. 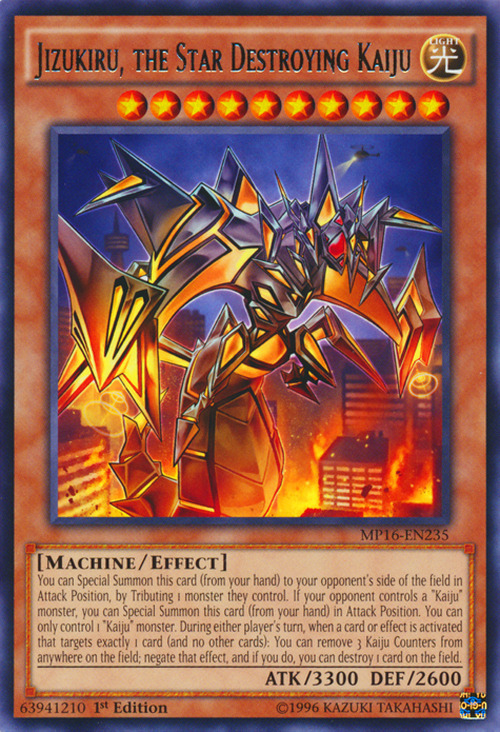 It is activated directly in a Chain to the activation of a monster effect that targets exactly 1 card, the activation of a Spell/Trap Card that targets exactly 1 card, or the activation of the effect of a Spell/Trap Card that targets exactly 1 card. "negate that effect" and "you can destroy 1 card on the field." are considered to happen at the same time. Also, the resolution of "negate that effect" is mandatory, but the resolution of "you can destroy 1 card on the field." is optional.